Use all organic ingredients as much as possible. Cook brown rice. Once brown rice is nearly done. 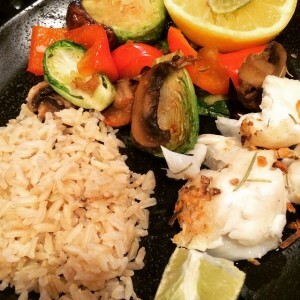 Spray your broil pan with coconut oil, season fish w/the herb seasoning, sea salt and garlic granules, broil the fish on 375F convection uncovered with squeezing half a lemon and 1/4 of a lime. Cut veggies and throw one large clove of garlic into sunflower oil in pan on stove. Saute and then add other veggies to the pan. Set aside and serve fish at once. Squeeze more citrus on fish if desired.